Renovating your bathroom is likely to be one of the most expensive, and most rewarding renovation jobs you ever undertake. Your bathroom is one of the most important rooms in the house and should be a place of great tranquility, relaxation and comfort. If you are thinking about renovating your bathroom but are worried about the costs, and their potentially getting out of hand, below are some budget friendly bathroom renovation ideas for 2017. There is nothing more comforting and pleasing than walking into a neatly arranged and organized bathroom. When bathrooms are not this way, it is typically because there is simply not enough storage space in them to accommodate everything. Vanities with compartmentalized storage, as well as drawers and shelves that are easy to keep organized, are essentials that are not overly expensive. Most older bathrooms have a single, dim ceiling light that doesn’t really make you feel at home. Adding some natural mood lighting, whether through built-in ceiling lights, or more trendy pendant lights, can allow you to set the mood in the bathroom. They can be picked up fairly cheap from most home improvement stores and come in a variety of shapes and sizes. Fittings and fixtures are little touches that make a big impact. They are one of the cheapest things you can change in a bathroom and add a lot of character and value. Chrome and matte black are classic fixture choices, or for something more modern, you can go with copper or brass. If you find one of the walls in your bathroom is full of cracked or dirty tiles, one of the best, cheapest, quick fixes is to turn the area into a feature wall. The tiles can be re-grouted to create a fresh new look, or even painted a different colour to create a nice accented area of your bathroom. The best part is you can do it with very little money and have it completed in a couple of hours. If you don’t have a coveted ceiling-mounted faucet in your shower, you can still get something great, with multi-functions, for not a lot of money. You would be surprised just how much charm and class a new, more modern shower head can add to a bathtub or shower. Renovating your bathroom doesn’t have to cost you an arm and a leg. With some simple upgrades and improvements, you can add a tremendous amount of value and atmosphere to your bathroom without breaking the bank. 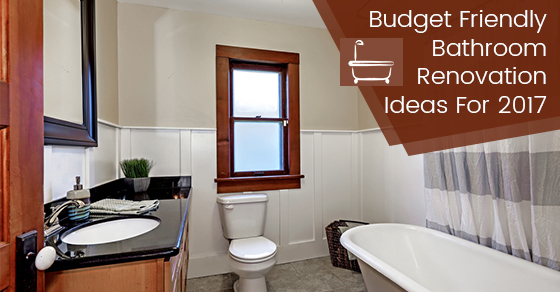 Keep the above budget friendly bathroom renovation ideas in mind and ensure that you end up with a great bathroom that doesn’t punish your wallet.